Even The Stars favourites PINS return with Wild Nights, the follow-up to 2013's Girls Like Us. It's a more reflective affair sonically than their debut, merging its post-punk spikiness with classic girl-group harmonies to create a cohesive record that's more ambitious than its predecessor. 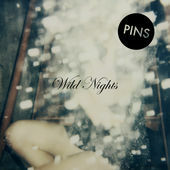 PINS fortunately don't suffer here from the second album syndrome that so many bands are cursed with when they've crammed every song they've ever written onto the first album and supporting singles and are then left with nothing left in the tank. The songs on Wild Nights have been gradually introduced into the set over the last eighteen months and were introduced to us at some low-key shows earlier in the year. They've not rushed into making this record and it's all the better for it. The first three songs are the closest they come to sounding like the band that made Girls Like Us. In particular the recent single Young Girls, with its unmistakable guitar riff and Faith's insistent persistent vocals, accompanied in parts, is a call to arms "what would we do, what would we do when our dreams come true, young girls" that's impossible to ignore, expressing the gang of friends mentality that make PINS such a tight-knit brigade. In a different time and place, it'd be a staple on radio as it has everything you need for a great alternative pop song. Curse These Dreams follows and is almost drowning in magnificent vocal harmonies that almost carry the song along on their own steam, not that it's needed. Sophie Galphin's drums are a constant presence throughout, whether it be in the ascending drum pattern that ushers in the chorus of Dazed By You or the shuffling metronomic opening to Oh Lord or the harmony-laden breakdown later in the song that she provides the only instrumentation to. It's a song of multiple changes of pace and direction, exploring song structures that the first album didn't approach. I've Got It Bad is a love song - "I looked at you, my sorrow died, this is the best I've ever had, I've got it bad" - and whilst this often isn't compatible with great music, this shows off a different side to PINS we've not really seen before. Every word is sung with emotion pouring of it and the backing vocals and harmonies of the breakdown, and this is a theme throughout, lift the song up and spin it round to bring it to its conclusion. It isn't all smiles and love though, the bitterness seethes through on recent single Too Little Too Late, a dismissive "I forgot to say Happy Birthday, I hope I didn't spoil your party" to the protagonist of the song is almost spat out at them. PINS aren't scared to expand their wings as well. House Of Love adopts a similar modus operandi to Oh Lord with changes of pace throughout accompanied by minimalist but in your face drums and guitars. The production very cleverly allows everything to be heard in the mix and also succeeds in recreating their live sound on the record as well. If Only has an addictive chiming guitar riff running through it that makes it feel like a great piece of pop music without losing the harder edge that still permeates the album. Much rawer is recent single Molly, the song which gives the album its title, with a number of changes and mood throughout before coming back to the big harmony-laden chorus line of "you look so good when you're bad / sad". A throbbing foreboding solitary guitar ushers in the final track Everyone Says, a song that works at the end of the album because of its simplicity, a counterpoint to the complex changes in pace that has run through most of the record of the album. It's the comedown at the end of the record and this accentuates its impact and allows Faith to demonstrate the range of her voice. Wild Nights feels like it's a natural stop-off of a journey that PINS are taking. It's a progression from Girls Like Us, the sound of a band that's increasingly comfortable in their own skin with a message to convey yet at the same time creating something that's going to appeal to their loyal and steadily growing fanbase. It takes a few listens to immerse yourself in it unlike the immediate hit-and-run impact of their debut, but it reveals further depths with every play like all records that truly endear do.